The MAX6887 MAX6888 multivoltage supply supervisors provide several voltage-detector inputs, one watchdog input, and three outputs. Each voltage-detector input offers a factory-set undervoltage and overvoltage threshold. Manual reset and margin disable inputs offer additional flexibility. 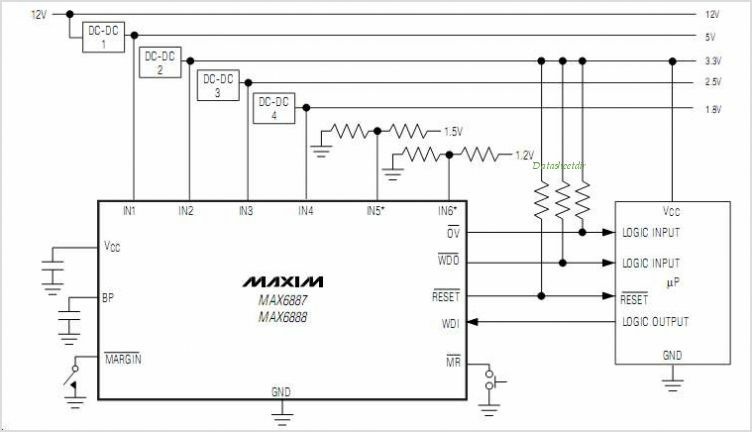 The MAX6887 offers six voltage-detector inputs, while the MAX6888 offers four inputs. Output active-low RESET asserts when any input voltage drops below its respective undervoltage threshold or manual reset active-low MR is asserted. Output active-low OV asserts when any input voltage exceeds its respective overvoltage threshold. Monitor standard supply voltages listed in the Selector Guide in the full datasheet. The MAX6887 MAX6888 offer a watchdog Timer with an initial and normal timeout periods of 102.4s and 1.6s, respectively. Watchdog output active-low WDO asserts when the watchdog Timer expires. Connect active-low WDO to manual reset input active-low MR to generate resets when the watchdog Timer expires. RESET, OV, and WDO are active-low, open-drain outputs. The MAX6887 MAX6888 are available in a 5mm x 5mm x 0.8mm, 16-pin thin QFN package and operate over the extended -40C to +85C temperature range. This is one package pinout of MAX6888,If you need more pinouts please download MAX6888's pdf datasheet. 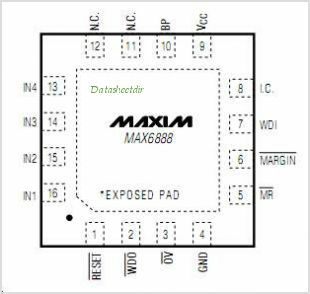 This is one application circuit of MAX6888,If you need more circuits,please download MAX6888's pdf datasheet.